Preheat the oven to 400 degrees. In a medium sized mixing bowl, combine the flour, sugar, salt, baking powder, and nutmeg. Using a pastry blender, a fork or your hands, cut the butter into the flour mixture until it is crumbly and no large chunks of butter remain. In a liquid measuring cup, measure out your eggnog and then whisk in the vanilla and egg. Add this mixture to the flour and stir until the dough just comes together. Tip the dough out onto a lightly floured surface and knead a few times. Pat the dough into a 9 inch round and cut into 8 wedges. Place the wedges on the baking sheet. Brush the scones with one tablespoon of eggnog and sprinkle with sugar. Bake at 400 degrees for about 20 minutes or until the tops are golden brown. Remove to a wire rack to cool. To make the glaze whisk together the powdered sugar and eggnog until the powdered sugar is completely dissolved. Drizzle the glaze over the cooled scones. 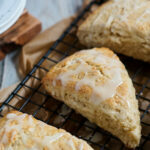 Because there is already a sugar topping on the scones, this glaze is somewhat thin. If you would like a thicker glaze, simply add a bit more powdered sugar. For best results, use regular eggnog, not milknog or alcoholic eggnog.